The 2018 Citi Open has a loaded and diverse field this year. Here is your preview of all the action on hard courts at the ATP 500 level. Last year’s champion Alexander Zverev will start his title defense against Evgeny Donskoy or Malek Jaziri. From there he should face his big brother Mischa in round 3, Mischa simply has to beat Tim Smyczek or Ricardas Berankis in round 2 to reach that stage. The younger Zverev is favored to reach the quarters. Denis Shapovalov vs Daniil Medvedev looks like a fantastic round 2 matchup, Medvedev faces qualifier Yosuke Watanuki in his first match. I’ll give Shapovalov an edge until he runs into Kei Nishikori. Nishikori faces Donald Young or Stan Wawrinka, both of whom are struggling, in his first match. The section looks like Nishikori’s to lose. David Goffin isn’t in great form but a path of Pierre-Hugues Herbert/Mitch Krueger and then most likely local hero Frances Tiafoe isn’t the most difficult. Tiafoe faces Hubert Hurkacz/Ilya Ivashka for a spot in the third round where he has a punchers chance against Goffin. The fourth section of the draw is a bit weak. Stefanos Tsitsipas and Nick Kyrgios are the seeds, neither are in great form and Kyrgios may not be fit. Jordan Thompson comes off a challenger final and I have him defeating Jared Donaldson while James Duckworth should defeat Thai-Son Kwiatkowski. I’ll go with Tsitsipas over Kyrgios in the third round, but this is a tough section to predict. Kyrgios should be favored if he’s healthy. John Isner won Atlanta (again) and looks set to make a run in DC if he’s fit. Noah Rubin or Mikhail Youzhny are unlikely to stop him while Andrey Rublev/Tommy Paul/Alex Bolt will also be underdogs in the third round. I have Isner into the quarters. Karen Khachanov vs Lucas Pouille looks like a good third round matchup. Khachanov should defeat Lukas Lacko/Denis Kudla, while Pouille should defeat Yuichi Sugita or Vincent Millot. I’ll take Khachanov to advance from the section. Despite Andy Murray being in his section, I’ll back Kyle Edmund to make a run. Edmund beat Murray on grass a few weeks back and Murray should still be rusty, even if he defeats Mackenzie McDonald in the first round. I have Edmund defeating Jeremy Chardy in round 3 with Chardy taking on Mirza Basic or Marius Copil in round 2. Newport champ Steve Johnson looks like a dark horse. Johnson will open with Vasek Pospisil/Alex De Minaur. Hyeon Chung played well enough in Atlanta to suggest he’ll beat Benoit Paire/Marcos Baghdatis, with Johnson or Chung advancing to the quarters. I’ll take Johnson to win the section. I’ll back Johnson and Isner’s form into the semis, while Nishikori should edge the defending champion and Goffin will win a weak section. I’ll back Nishikori to triumph in this one though Isner could also win. An afternoon rain delay sent play late into the night once again at the 2017 Citi Open, fan favorites Kei Nishikori and Juan Martin Del Potro made winning starts. Nishikori was pushed deep into the third set against Donald Young. The first set was up and down, with Young going down 1-4, and coming back a bit but dropping the first set in the end 6-3. Set 2 would go Young’s way 6-4 as he scored two breaks, and even though he missed a break point on his return game up 5-3, he served out the second set to force a third. The third set had no breaks, but Nishikori had break points in most of Young’s service games, and kept the pressure on, generating three match points. Nishikori would get three more match points in the third set tiebreak, and finally took the match 6-3 4-6 7-6. Del Potro had an easier time of things against Lukas Lacko, winning 7-5 6-2 as Lacko went away after a close first set that featured five breaks of serve, the last one going the way of the Argentine. Del Potro really picked up his game in the second set. Other winners on the men’s side included Dominic Thiem and Jack Sock, Thiem lost just a handful of points on his serve against Henri Laaksonen, winning 6-3 6-3, Sock defeated Marius Copil in two tiebreaks. Marcos Baghdatis put a beating on first time main draw participant Edan Leshem, Jordan Thompson dispatched Ruben Bemelmans 6-3 6-2, Kyle Edmund took advantage of Hyeon Chung’s struggles 6-3 6-1, Malek Jaziri beat Alessandro Bega 7-5 7-5. Dmitry Tursunov won his first match of the season 6-4 6-7 6-4 over Mitchell Krueger, American Tennys Sandgren had better luck against Go Soeda winning 7-6 6-3, and Argentina’s Guido Pella upset Mischa Zverev 6-7 7-6 6-3. Zverev’s poor form on hard courts is starting to put his career best rankings as of late at risk. A good number of WTA singles matches were cancelled because of rain, but Simona Halep, Ekaterina Makarova, Monica Puig, and Patricia Maria Tig all came away winners in straight sets. Three American women, Sloane Stephens, Jamie Loeb, and Luisa Chirico were their victims, along with Britain’s Heather Watson. Four teams have reached the quarterfinals in men’s doubles. Jamie Murray and Bruno Soares, Cerretani/Polmans, Rojer/Tecau, and Kubot/Melo are those teams, with four more spots to be determined. In women’s doubles the quarterfinalists so far are Mirza/Niculescu the top seeds, Abduraimova/Tig, Lister/Lu, and Aoyama/Voracova the #2 seeds. Daniil Medvedev needed two and a half hours, and the maximum three sets to defeat American Reilly Opelka, but in the end the experienced Russian took the match 6-7 6-3 7-6. Medvedev had a set point in the first set, that he didn’t take, even though he was steady on serve and saved break points in multiple games. In the second set Medvedev got a double break to force a third set. In that third set Opelka went up a break but quickly lost it, the American would have a match point in the ensuing third set tiebreak, but Medvedev saved it and took the match. Other winners in round 1 men’s action included Lukas Lacko and Marius Copil over qualifiers Alexios Halebian and Sekou Bangoura in straight sets, Guido Pella over qualifier Ramkumar Ramanathan in straights, Yuki Bhambri via retirement against Stefan Kozlov, and Nicolas Mahut over Thomas Fabbiano in straight sets. Tommy Paul also outlasted young gun Casper Ruud, winning via retirement as Ruud wilted in the heat. Henri Laaksonen pulled the upset against Vasek Pospisil 6-7 6-4 6-3, Laaksonen broke at the end of set 2, and then recovered from a break down in the third set to take the match, as Pospisil collapsed from 3-3 in the third. Donald Young defeated Tim Smyczek for the second time in as many weeks 4-6 6-3 6-4. Young got off to a slow start and was broken twice in the first set, but he broke in set 2, and then in a topsy turvy third set he got the final break of the match, saved two break points on his serve, and held his next service game to prevail. Jared Donaldson also scored a comeback win, the American beat tour veteran Dudi Sela 6-7 6-4 6-3. He dropped the first set but was in control most of the match, he finally learned how to take advantage of Sela’s weak serve and score the win. In WTA action Arnya Sabalenka upset Lauren Davis in straights, Julia Goerges beat Francoise Abanda in straights, Andrea Petkovic danced her way to a win against Kurumi Nara, Oceane Dodin upset Jelena Jankovic via retirement, Sara Errani beat Risa Ozaki in straights, Alison Van Uytvanck beat Jana Cepelova, Bianca Andreescu upset Camila Giorgi in three sets, and Mariana Duque-Marino beat Shelby Rogers in straights. 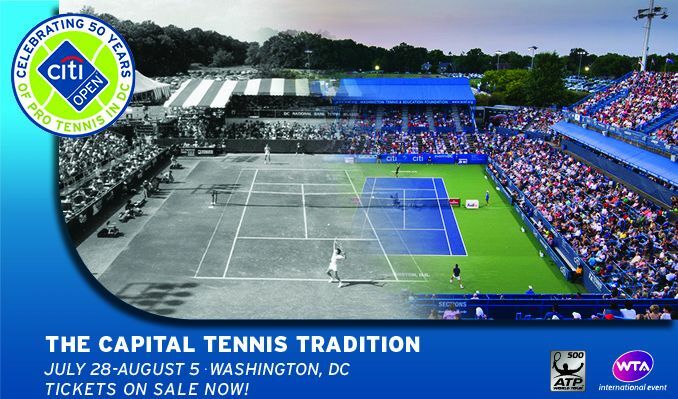 The only 500 level tournament in the United States, the Citi Open, is back for edition #49. Here is your full preview with predictions, as Tennis Atlantic will have on-site coverage all week from the nation’s capital. Washington has attracted three top 10 players on the men’s side, and a solid group of top 20 seeds. Dominic Thiem is back in North America, and as the top seed he has a weight on his shoulders in Washington. The Austrian should slip past Vasek Pospisil or Henri Laaksonen and then defeat Kevin Anderson in round 3. Anderson played well at Wimbledon, and will need to defeat either Malek Jaziri or Alessandro Bega to reach the third round. Anderson’s serve makes him a threat, but Thiem has a better all-around game. Mischa Zverev hasn’t been in great form this year but should be better than either Ramkumar Ramanathan or a struggling Guido Pella. Gael Monfils should show his range against Yuki Bhambri or Stefan Kozlov, before putting away the serve and volleyer Zverev with his superior movement in the third round. Milos Raonic looks safe against either Nicolas Mahut or Thomas Fabbiano, given both players are struggling. Atlanta finalist Ryan Harrison should be up in round 3. Harrison needs only to defeat a struggling Marcos Baghdatis, or ATP main draw debutante Edan Leshem. Given Harrison should be fatigued, Raonic is the favorite to reach the quarterfinals. John Isner and Jack Sock look to be on a collision course in round 3. Sock opens with Sekou Bangoura or Marius Copil and should win that. Isner has won eight matches in a row, and if he can overcome a possible knee issue, he should defeat Dudi Sela or Jared Donaldson. I’ll go with Sock over Isner given the fatigue factor, Sock really could use a win against Isner to boost his confidence this Summer heading into the US Open. Despite somewhat disappointing results this year, Kei Nishikori remains one of the most talented players in men’s tennis, and should defeat either Donald Young or Tim Smyczek in round 2. Juan Martin Del Potro awaits in round 3, Del Potro is a solid player, but he’s still a shell of the player he once was, and Nishikori is the favorite to reach the quarterfinals. Del Potro faces Alexios Halebian or Lukas Lacko in round 2. Look for the in-form Gilles Muller, a semifinalist in Atlanta, to make a run at the Citi Open. Muller begins against Mitchell Krueger or Dmitry Tursunov, who hasn’t won a match this year. Lucas Pouille will be up in round 3, Pouille will face Atlanta quarterfinalist Tommy Paul, or another young gun, Casper Ruud, who has been struggling a bit, and tends to prefer clay. Pouille is credible on hard courts, but Muller should win if the court is fast enough. The two remaining sections of the draw are pretty stacked. Grigor Dimitrov is 17-4 on hard courts this year, Atlanta semifinalist Kyle Edmund is likely up in round 2, unless Hyeon Chung spoils things. Dimitrov should be better than Edmund. Talented young Russian Daniil Medvedev should beat big serving American Reilly Opelka, I have Steve Johnson reaching the third round with a win over Medvedev, before falling to Dimitrov. Alexander Zverev should have an edge against Nick Kyrgios. Kyrgios hasn’t been healthy, but he should beat Go Soeda or Tennys Sandgren. Both Ruben Bemelmans and Jordan Thompson are in great form, but Zverev played well enough during the grass court season that he should safely reach round 3, and then defeat Kyrgios, who I doubt is 100%. If Medvedev can find form against Johnson and Dimitrov he could well make his breakout in North America. The Russian has had a fantastic season and he’s primed to be a much bigger name than he is right now on the ATP tour. Dimitrov vs. Zverev is the hardest matchup to pick, but I like Dimitrov’s form, the big seeds Raonic, Thiem, and Nishikori should be set to make the semis. On hard courts Raonic’s serve is a formidable weapon, Nishikori should be able to rise to the occasion against Dimitrov or Zverev, before falling to the big serving Raonic in the final. Milos could use a title heading into the US Open. WASHINGTON (June 13, 2017) — D.C.’s summer just got hotter as 20-year-old phenom Alexander Zverev and Canadian starlet Eugenie Bouchard join this year’s Citi Open® Tennis Tournament player field. In addition, American fan favorite Steve Johnson has also committed to compete in the 49th edition of the Washington tournament. Bouchard, Zverev, and Johnson join previously announced players, including defending Citi Open champion Gael Monfils, three-time Citi Open champ Juan Martin del Potro, World No. 8 Dominic Thiem, 2015 finalist John Isner, and Olympic gold medalist Monica Puig. The Citi Open® also welcomes back the world’s winningest doubles team, Bob and Mike Bryan.. The tournament will be held July 29 – August 6 at the Rock Creek Park Tennis Center and benefits underserved and low-income kids in the D.C. community through the Washington Tennis & Education Foundation. So far this year, the last few months have been a highlight of Zverev, Bouchard, and Johnson’s seasons. Zverev became the youngest ATP Masters 1000 champion since 19-year-old Novak Djokovic in 2007, when he captured the title in Rome. In the meantime, Bouchard defeated former World No. 1 Maria Sharapova in the second round of the Madrid Open — a three-set thriller that has already been touted as one of the best matches of the year. Johnson, a two-time Citi Open semifinalist, captured the second title of his career in Houston. Single session tickets, weeklong packages and other ticket plans are on sale now at www.citiopentennis.com or by calling the hotline 202.721.9500. Each ticket provides fans access to the action on all six courts, with both men’s and women’s matches, for as many as 24 matches per session. Tickets to gain admission to the tournament’s signature events will be announced soon. The Citi Open Tennis Tournament is one of only 13 elite ATP World Tour 500-level events worldwide and the only one held in the United States. The tournament represents a WTA International event and having both ATP and WTA players provides fans the opportunity to watch simultaneous competitions of both world-class men’s and women’s tennis throughout the nine-day event. It is one of only five U.S. tournaments that include both men’s and women’s fields. Main draw matches of the tournament will be broadcast starting Monday, July 31, on Tennis Channel. Gael Monfils showed his tremendous talent, as he dug deep to defeat the big serving Ivo Karlovic 5-7 7-6 6-4 in the 2016 Citi Open final. It’s the first 500 level title for Monfils, and his first title in over two years, as he’s historically struggled in ATP finals. The Frenchman had a great week in Washington, and his positive mood wasn’t dampened after dropping the first set against Karlovic. The 37 year old Croatian was bidding to win his second ATP title in a row, and he got off to a good start, putting pressure on Monfils serve and eventually breaking, although he had to save three break points from 0-40 down in the ensuing game, serving 6-5 for the first set. That initial tightness under pressure for Ivo would rear its ugly head in the second set. Despite being broken to go down 7-5 5-4, Monfils was not down for the count after all. Karlovic wasn’t broken all week up to that point, but went 0-40 down serving for the match, and although he got it back to deuce, a fourth break point in the game gave Monfils the chance to attack and level up the match at 5-5. He went on to improve his serving and force a third set with a second set tiebreak victory. In that third set, the fresher Monfils, a far superior mover, broke Karlovic early, and held serve from there to pull away for the title, leaving Karlovic pleased with his week overall, but disappointed to lose when he was so close to victory. Dr. Ivo had a match point in the second set tiebreak, but it wasn’t on his serve, and despite serving well, with 28 aces and 84% of his first serve points won, he couldn’t win enough return points to prevail in a close match. In the doubles final, Daniel Nestor and Edouard Roger-Vasselin beat Lukasz Kubot and Alexander Peya in a pair of tiebreaks, as the veteran Canadian doubles specialist claimed another ATP title. It was an exciting week of tennis in Washington to kick off the summer hard court season in the USA. The Citi Open organizers, volunteers and staff deserve credit for running a fantastic event. In Friday night action at the 2016 Citi Open, Gael Monfils and Alexander Zverev setup a big semifinal clash scheduled for Saturday night, as both fan favorite players continued their good form this week, defeating Sam Querrey, and Benoit Paire respectively. Monfils played a quick three set contest with Querrey, winning 6-4 3-6 6-1. Querrey showed tremendous power to hit through the ball and push Monfils off the court at times, but Monfils strong serving saved the day for him. The Frenchman got one break in the first set, and didn’t face any break points on his own serve. In the second, a push by Querrey got him a needed break, and he upped his own service consistency to force a third set. Monfils had an extra gear though, with the match on the line, he went 3-0 up in the third after saving two break point chances, and ended up rolling past Querrey, who faded late. Monfils superior movement, and comparable service skill on hard courts was enough to defeat Querrey, despite his best efforts. Benoit Paire played a miserable contest, and Zverev dropped him with ease 6-1 6-3 in less than an hour. Paire got jumped by Zverev on his serve, and found himself broken three out of four times he served in the first set. In the second set, Zverev’s lethal baseline play continued, he put tremendous pressure on Paire’s serve and got the break he needed, dominating his own service games to walk away a routine victor. The young German has demonstrated he’s going to be a dark horse threat in later tournaments this summer, and remains in the running for his first ATP title. In men’s doubles, Kubot/Peya defeated Johnson/Sock, and Kontinen/Peers ousted a tired Querrey and Chris Guccione in a tight second set tiebreak. Johnson vs. Karlovic, and Zverev vs. Monfils are the men’s semifinals. The first semifinal should feature tiebreaks and a lot of big serving, while Monfils and Zverev are more likely to contest their match from the baseline and rally for winners. In Men’s doubles semifinal action, it will be Mergea/Tecau against Nestor/Roger-Vasselin, and Kubot/Peya vs. Kontinen/Peers as doubles specialists are the only remaining options for men’s doubles champion at the Citi Open.